Take-up of 140,845m2 was achieved in the Dublin industrial market in 2011 compared with more than 170,000m2 of take-up in this sector of the market in the previous 12 month period, which clearly illustrates the extent to which economic conditions are impacting on occupier relation and expansion decisions. A total of 33,603m2 of take-up in 30 transactions was achieved in the Dublin industrial market during the last three months of the year. This represents a 17% decline on the volume of industrial take-up achieved in Dublin during the previous quarter. More than 70% of take-up in the industrial sector during 2011 comprised lettings as opposed to sales as a result of the scarcity of debt funding in the market. However, a number of significant sales signed in Q4 led to 54% of take-up (18,215m2) in the final three months of the year comprising sales and the remaining 15,388m2 or 46% of Q4 take-up comprising lettings. There were 22 individual lettings signed in the industrial sector in Dublin in Q4, while there were 8 sales of industrial buildings completed in the capital in the period. The largest industrial lettings signed during Q4 2011 include the letting of a 1,858m2 facility at Cherry Orchard Industrial Estate in Dublin North West (N4) and the letting of a 1,851m2 facility at Harold’s Cross in Dublin South City. The largest sales concluded in Q4 include the sale of Unit 25, Grange Parade, Baldoyle Industrial Estate in Dublin North East (N1/M1) and the sale of the former Belgard Motors facility on the Dublin South West (N81) corridor. The Dublin North East (N1/M1) corridor, accounted for the greatest proportion (31%) of industrial sales and letting activity in the capital during Q4 2011. The Dublin South West (N7) and Dublin South West (N81) corridors accounted for a further 21% and 14% of industrial take-up respectively in the quarter. On an annual basis, these corridors were also responsible for the lions share of lettings and sales activity in the industrial sector during 2011. Of the industrial lettings signed in the fourth quarter, 16% were smaller than 465m2 in size, 28% were between 466m2 and 929m2 in size while the greatest proportion (56%) were between 930m2 and 1,858m2 in size. By comparison, 80% of the sales signed in the quarter were buildings that extended to more than 1,858m2 in size. Demand for industrial accommodation in the Dublin market was just over 90,000m2 at the end of the fourth quarter, a quarterly decrease of 12.5% which is perhaps not surprising considering the economic backdrop and ongoing concerns about the Eurozone. More than a quarter of requirements for industrial accommodation in Dublin at the end of Q4 was specifically focussed on buildings along the Dublin South West (N7) corridor with a further 18.5% of demand focussed on the Dublin North East (N1/M1) corridor. Prime quoting rents in the Dublin industrial market remained stable in Q4 2011 at €65 per square metre although there is likely to be some further downward pressure on this level before rents ultimately stabilise in 2012. Tenants continue to negotiate very favourable terms and conditions, particularly on secondary accommodation. 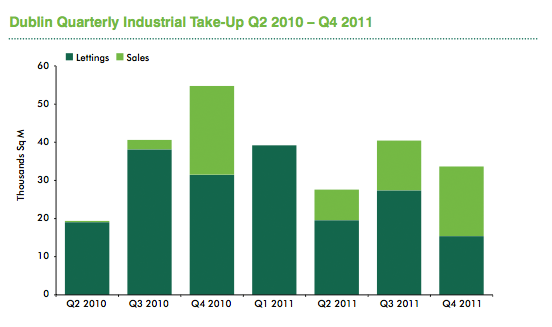 There were no industrial investment deals completed in the Irish market in 2011. Despite the lack of transactional evidence, we believe that prime yields for Dublin industrial properties are now in the order of 9.5%.